Temperatures will be slightly higher than usual for this time of year. MANY PARTS OF the country are set to enjoy more sunshine today, but some rain is on the way. Met Éireann has said it will be largely dry and sunny for the morning. In the east and south, temperatures will peak between 15 and 19 degrees. In the west, particularly at the coast, temperatures will be several degrees lower and it will become cloudy during the afternoon. Winds will be light and variable to start, becoming moderate and southwesterly later. Patches of sea fog will affect the south and southeast coast at times, making it colder. Rain will arrive in the west during the late evening, spreading eastwards overnight and becoming scattered showers before morning. Lowest temperatures will range from six to eight degrees Celsius, with moderate southwest winds. Tomorrow is expected to be a day of sunshine and showers, with rain most frequent in the west and north. Temperatures will range between 12 and 14 degrees, still just a little higher than usual for this time of year. Winds will be moderate to fresh from a southwesterly direction. Tomorrow night will be mainly dry as showers die out. Lowest temperatures will range from five to seven degrees in a moderate to fresh westerly wind. 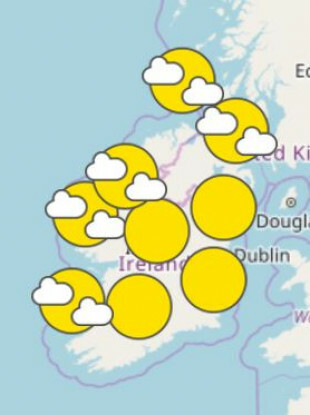 Met Éireann has said Monday will be mainly dry to start for much of the country, but showers will become established from early on in western areas and become widespread during the afternoon. Day time temperatures will be typical for the time of year, even a couple of degrees above average, at between 12 and 15 degrees in a moderate to fresh southwest to west wind. Showers will die out on Monday evening and it will be mainly dry overnight, with temperatures dipping to between five and seven degrees. Wet weather is expected to develop on Tuesday in the south, extending northwards later. Temperatures will remain typical for the time of year. Email “We're going to get more sunshine today, but rain is on the way”. Feedback on “We're going to get more sunshine today, but rain is on the way”.